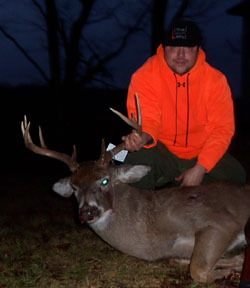 Mike Decker arrowed this nice buck at 40 yards on the evening of October 26, 2012 . 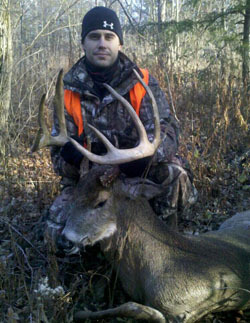 Michael Carr took this 11-point in Albany County during the second week of the 2012 gun season with his 20 gauge shotgun. The buck dressed out at 164 lbs. 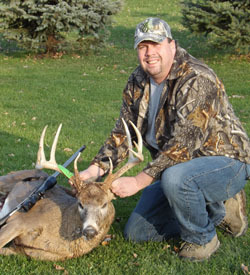 Ron Hart harvested this handsome Montgomery County 8-point on November 17, 2012 at 320 yards with his Ruger .270 cal rifle. The buck scored 151-3/8 gross, netted 146-3/8 and weighed in at 185 lbs. 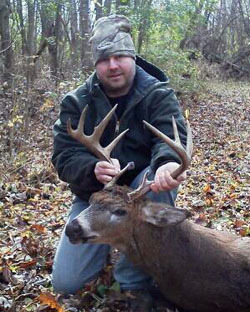 Bernard Kosciuk arrowed this 8-point on December 23, 2012 at 3:30 p.m. in Suffolk County at 45 yards. Bernard puts the buck at 125 inches with a dressed weight of 140 lbs. 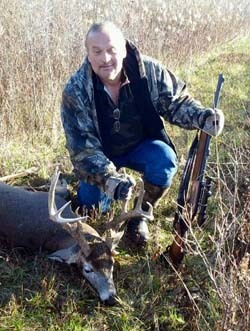 Bob Kirsch with his Wyoming County, nine point taken on 10/21/2012. 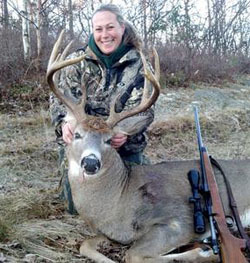 The buck weighed 189 lbs, ans scored163-7 gross and 157 net. 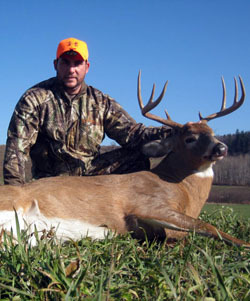 Richard McGilvray took this 11-point during the second week of the 2012 archery season in Cattaraugus County. 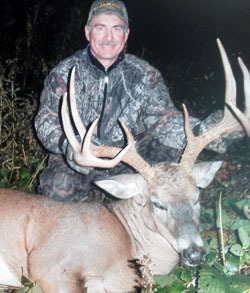 Richard arrowed the buck from ground at 35 yards with his compound bow and is his biggest deer to date. 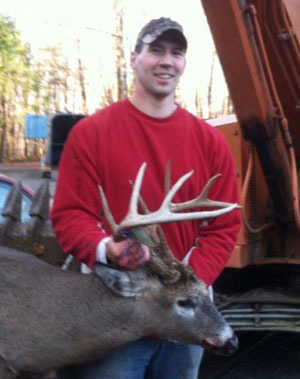 Michael Kellogg, of Waterville, NY took this 15-point Oneida County buck on Thanksgiving day 2012. The buck has an inside spread of 17.5 inches and green scores 155 6/8. 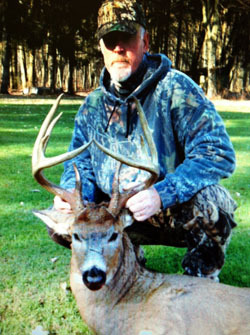 Randy White kept the dice rolling with a 147 inch 9-point on opening day of gun season 2012 also in Arcade, NY. 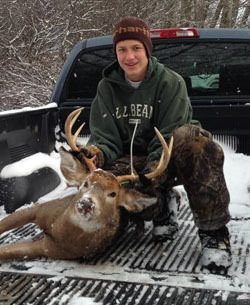 This 12-point was taken by Joe Saroli in the Town of Hector, NY - Schuyler County on November 17, 2012. The buck dressed out at 179 lbs. 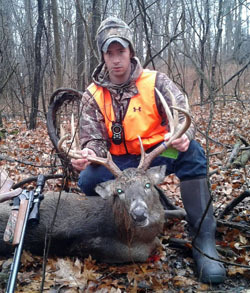 Ben Barkley of the Sylvan Falls Club took this buck on November 23, 2012 in St. Lawrence County. The 9 point had a 20" spread with an 8" double brow tine. 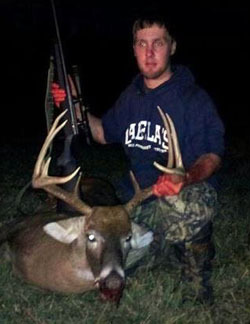 Tyler Barber poses with his Livingston County 11-point taken on 12/18/12 in Caledonia. 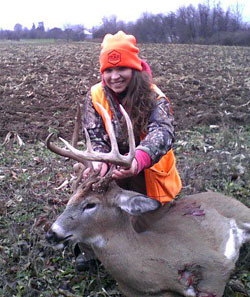 Heather White with her 12-point taken in Hillsdale, NY, Columbia County, on 11/18/12. This is very her first deer. Heather used her Dad's .25-06 to make the 150 yard shot. The buck green scores 151-5 and the dressed out at 168 pounds. 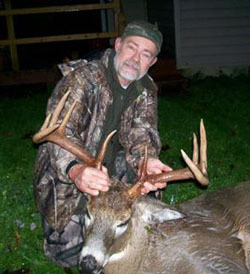 Tom Rowland harvested this handsome Ontario County 12-point on 11/17/2012 with his muzzleloader at 30 yds. The buck scores a gross 142 . 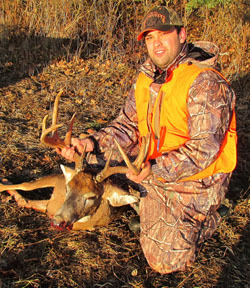 8-point, taken on the last day of 2012 regular season. 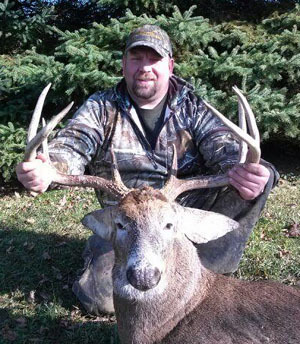 JT Murray poses with his big, no brow tines, Orleans County Buck. 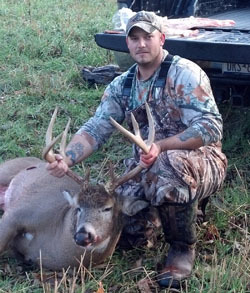 Cayuga County buck taken by Tony Bottar on 11/18/2012. The buck is aged at 4-1/2 and weighs in at 205. 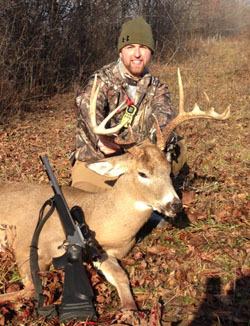 Mike Gilman with his 10 point taken in Cohocton, NY - Steuben County on November 17, 2012. 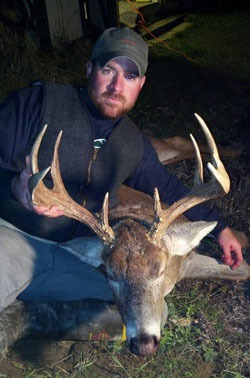 Greg Sanders of Jefferson County shot this big 10-point on November 7, 2012. The 4-1/2 year old buck has green score of 158-7/8 and weighs in at 174 lbs. 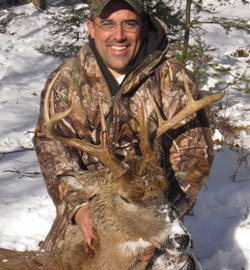 Pat Smart of the Ham Val hunting club orginated in 2004 by a group of men with a passion to hunt whitetails took this Onondaga County (7F) 10-point on the first weekend of shotgun season and has yet to be scored. 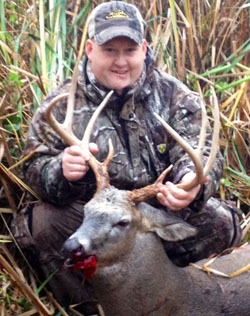 Matt Bennett with his Livingston County Buck taken with TC Muzzlelaoder on 12/12/12. 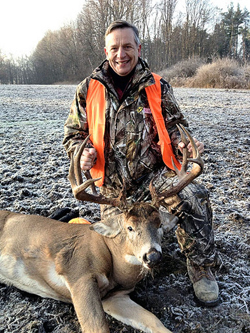 Gene Salvino, of Coxsackie, NY took this 11-point non-typical buck while hunting in Greene County Thanksgiving morning. 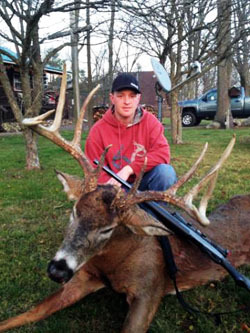 The buck has a 23-1/2-inch spread with a green score of 163 4/8 and weighing in at 175 pounds. 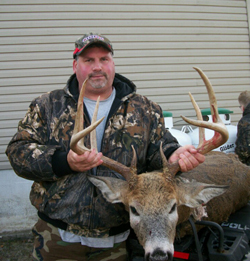 Tom Tagliareni took this 14-point buck on November 24, 2012 in Steuben County. The buck had an inside spread of 19 1/2 inches. 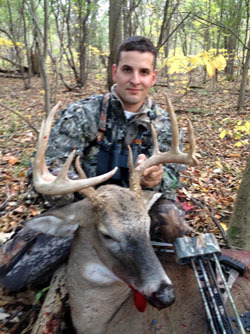 Thomas Chappell took this 10-point in Canandaigua,NY - Ontario County on 11/07/2012. He and a big 8-point were both chasing a hot doe and he came in at 32 yards. The buck scored 136" with a 17.5 " inside spread and 9 inch g-3's. He weighed almost 230lbs on the hoof. 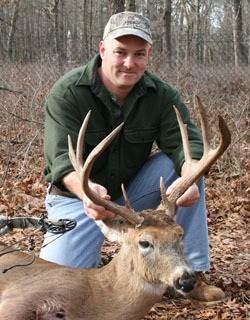 Tom's best archery buck. 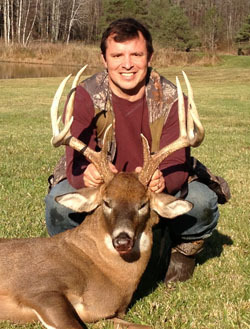 Tom Wills got his 8-point just less than a hour before Debbie Wills got hers on 11/18/12. 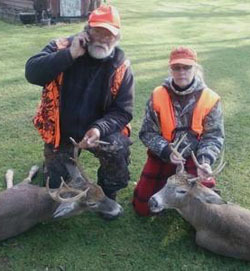 Both bucks were taken on the Wills' own 30 acres in Newfane, NY - Niagara County. 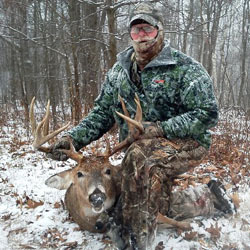 Jeff Ames took this 10-point in Steuben County on 12/4/12 right before the weather front moved in. The green score is 134. 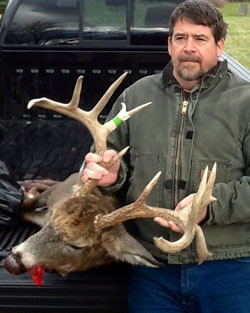 Ten-point taken in Livingston County by Gary "Rags" Myers. 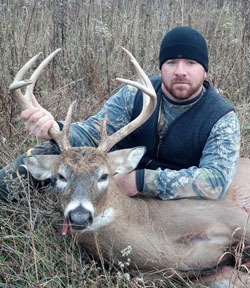 The buck gross scored 169.4, field dressed at 205. Taken with Encore 50 Cal. 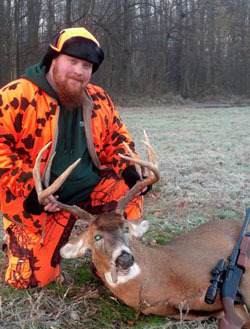 muzzle loader on 11/25/12. 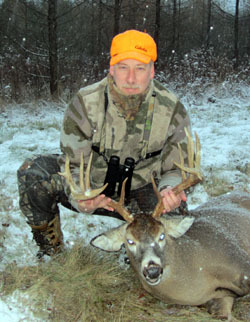 Doug McCall of Cortland County poses with his 10-point taken with bow on Nov 1, 2012. Green score is 136. Actual dressed weight was 198 lbs. Inside spread is 19.5". Aged at 3 1/2. 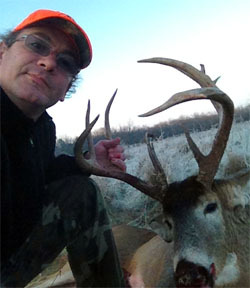 Louis Backlas took this main frame 12-point buck 10/14/12 with his bow! 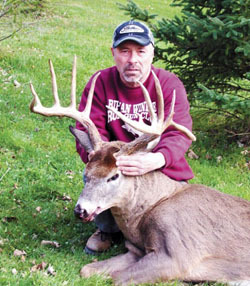 The buck green scored 152 and was taken in Wyoming County NY. 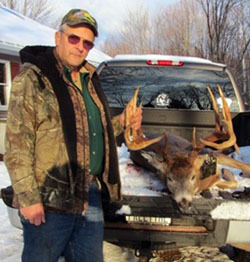 Ray Swope took this main frame 12-point monster in the Town of New Haven - Oswego County on 11/28/2012. Unofficial green score is 190-6/8 gross, 181-3/8 net. The buck weighed in on certified scales at 165 lbs. 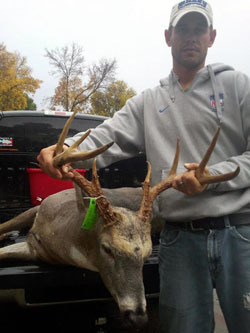 12-point shot by Ronnie Wiggins on November 10, 2012 in Lyons, NY - Wayne County during bow season. The buck dressed out at almost 200 lbs and scores around 145. 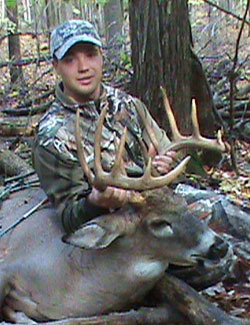 Trevor Noonan shot this beauty on opening day in Mohawk, NY - Herkimer County. no score yut, but the buck weighed 190 lbs field dressed. Coray Ciao arrowed this 10-point on Columbus Day, 2012. 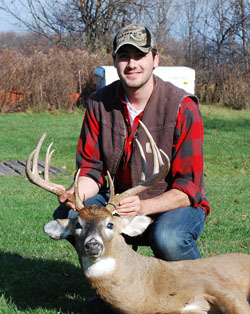 The Livingston County (8H) buck aged at 3-1/2 years old. 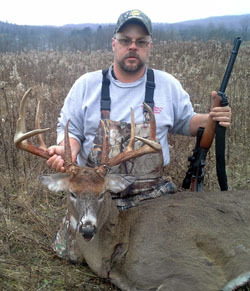 Big 8-pointer taken by Benny Leto on November 18, 2012 in Otsego County, NY using a .243 Sako A7. This brute weighed 195 lbs AFTER being field dressed, had an inside spread of 19" and gross scored 115 5/8". 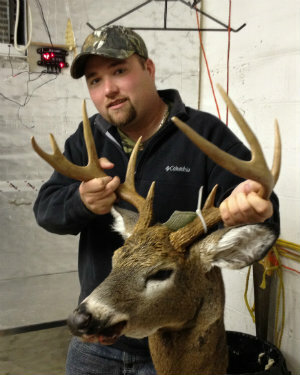 Tom Hayward ll with his Seneca County 8-point taken with bow on 11/11/12. 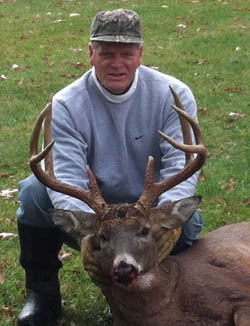 Tom Hayward with another Seneca County buck, a 9-point taken with gun on 11/18/12. The buck dressed out at 190 lbs. 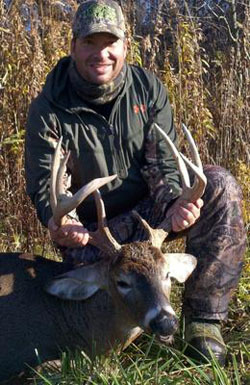 Eric Van Leer with his opening day 2012 regular season buck: Taxidermist scored it at 155. Weight estimated at 188. The buck is a 10-point. Town of Kill: Ulysses, (Nearest Village Trumansburg, NY). Taken with Remington 1100 with rifled barrel & Leopold variable scope. 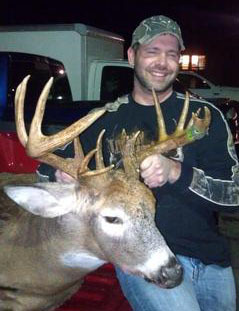 Mike Yochum with his 10-point taken in Steuben County on 11/30/2012. Green scored 154. 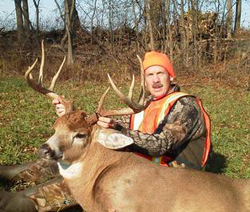 Tony Casella took this buck in Ontario County. 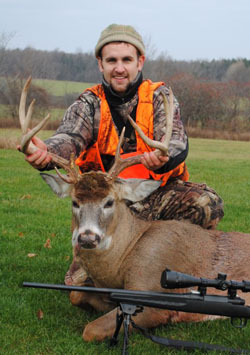 He was taken with a 20 gauge single shot shotgun at 175 yards on opening day of regular season 2012. His gross score was 131-1/8. 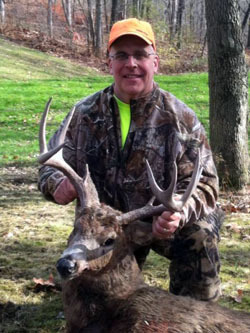 Tom Taber arrowed this big buck in Schuyler County with an official green score of 152-6/8. 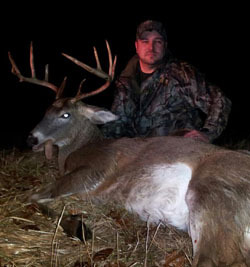 The buck weighs in at 190 lbs and was shot on 11/04/2012. 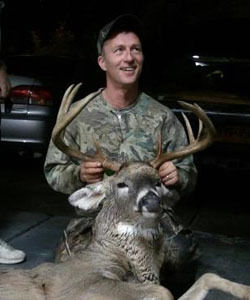 Jody Smith took this beautiful 8 point buck on October 7th during archery season 2012. 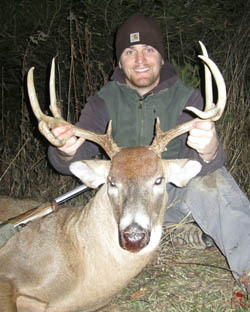 The bucks tines measure 12-1/2 “ long, and aged out at 2 ½ years old. His biggest buck to date. Killed in Livingston, NY. 8H region.